Nothing wrong with bringing your twin loop wire back to basics. But these transparent coated wires from Renz are a notch above plain metal. They have a protective coating, making it easy to use and transport and leave your desk scratch-free. And Renz offers both 2:1 and 3:1 pitch. The 3:1 pitch is used for sizes 1/4" - 9/16" and the 2:1 pitch is for sizes 5/8" - 1-1/4". Anywhere from 30 to 220 sheets of 20lb paper can be bound together. And we have them at standard lengths; just make your binding process a little easier. 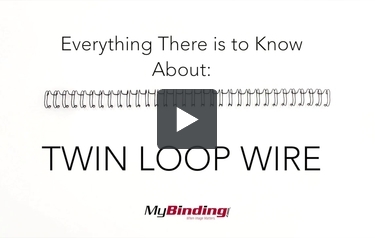 Twin loop wire binding will result in professional, easy-to-use finished documents.